St Chad’s Well, Near Tinedale Farm, Spen Brook, Lancashire. 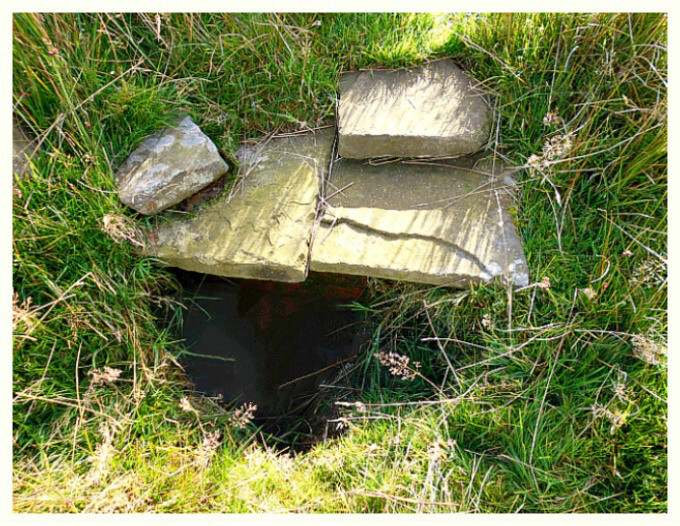 St Chad’s Well is located in a boggy field with reed beds, just east of Tinedale Farm, 1 mile south of Newchurch-in-Pendle. From above Hoarstones, Fence, go north along the country lane, then at the very top walk along the straight farmtrack with a sign for Rigg of England and Tinedale Farm. After a while take the second wall-style leading into the field. At the centre of this, often boggy field where the power cables intersect, look for a large area of reeds, here hidden away is the largerly forgotten holy well. It is covered by two flat stones, together measuring 3 feet across, while the well-basin is roughly 1 foot in depth, and is lined at one side by brickwork (which looks recent). There is a layer of mud at the bottom, but the water is quite clear ‘upon cupping’ one’s hands in the water, though probably ‘not drinkable’ today! According to local legend St Chad, a 7th century Anglo Saxon saint, who became Archbishop of York, came to this area during his travels in the north of England. However it is more likely one of his many disciples came here and dedicated the well to his master. It is though, as we already know, a pre-Christian well/spring. I am not aware of any cures happening at this well, though I’m not saying they didn’t happen here long ago. I am told that the water was used by local farms in the area of Tinedale, according to a gentleman who is a member of ‘The Pendle Forest Historical Society’. The well is “now” only marked on old maps of the area. Regarding St Chad, who died in 672 AD, one or two historians have ‘suggested’ albeit tenuously, that the village of Chatburn, near Dowham, is named after the well-known northern saint, though there does not appear to be any credible link with the saint to the actual place. However, the name is usually taken to mean Ceatta’s Stream in the ‘Old English’ form – meaning Ceatta/Ceada (a personal name) and burn (a stream); the two other forms of Chad’s name are, of course, Ceadda and Ceatta! The local author/historian John A. Clayton informs us in his excellent book ‘Burnley And Pendle Archaeology – Part 1 – Ice Age to Early Bronze Age’, that: “in 1978 a small stone bust, possibly of the Romano-British goddess Sulis/Minerva, was discovered near to the well.” And he says: ‘This, along with Roman pottery recently found by [himself] in nearby Sabden Fold, strongly suggests that the ridge-top site [above the holy well,] sitting as it does on a major ancient trade route, was of importance in the Roman Iron Age.” The ridge-top site which Clayton alludes to is called ‘Standing Stone Height’. The well stands close to an ancient trackway, which apparently pilgrims used in order to get to Whalley Abbey, 4 miles to the north-west. Tinedale (Tynedale) farm is “said” to be haunted, and it was associated at the beginning of the 17th century with the Pendle Witches, who met at Malkin Tower, a scant ruin to the north of the farm – between the farms of Bull Hole and Moss End, according to the late John Dixon in his work ‘Historic Walks Around The Pendle Way’. Tinedale farm dates from 1750 but the original building was of 1600. In this area, too, we are told ‘the ancient fire festival of Beltaine’ used to take place – long ago back in the mists of time. Clayton, John A., Burnley And Pendle Archaeology – Part 1 – Ice Age to Early Bronze Age, Barrowford Press, 2014. Farmer, David., Oxford Dictionary of Saints, Oxford University Press, 2004. 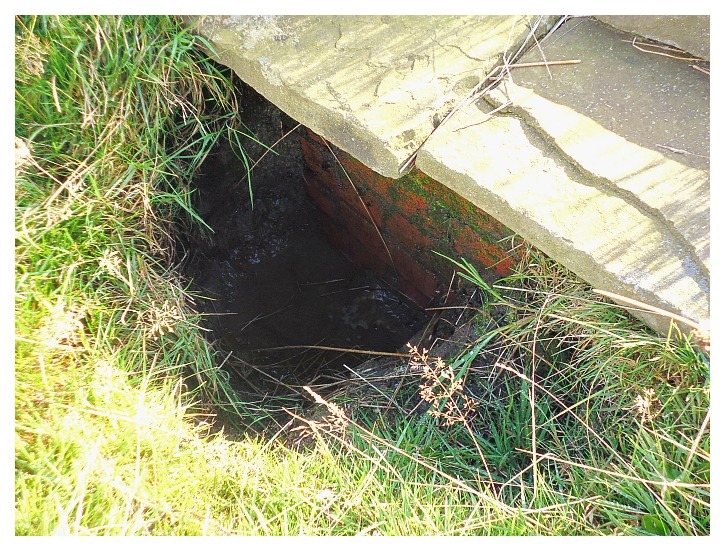 Categories: Holy Well, Misc Subjects | Tags: St Chad's Well near Tinedale Farm at Spen Brook in Lancashire | Permalink.